The Centre for Newfoundland Studies in the Queen Elizabeth II Library contains the largest and, possibly, the best collection of Newfoundland and Labrador material available in the world. It has at least one copy of almost every book ever published about Newfoundland and Labrador. Its bibliography of periodical articles about the province numbers well over 68,000 items. It houses the Newfoundland and Labrador periodical collection and the pre-1900 map collection. The home for many of its treasures, however, is its archives and special collections. Begun in the mid-1970s, it contains 300 linear metres of manuscript materials and over 100,000 photographs. A view of Memorial University with a brightly-light Queen Elizabeth II Library in the left-centre. © 1997 Photographic Services, Memorial University of Newfoundland, St. John's, Newfoundland. From November 1993 to December 1999 Bert Riggs, the centre's chief archivist, wrote a series of articles for The MUN Gazette, the university's newspaper. Known as "Memorial's Archival Treasures," the articles introduced the various collections in the archives to the reader. But Riggs did more than just describe the collection: he explored aspects of the social, cultural and political life of Newfoundland and Labrador throughout the 19th and 20th centuries for the most part, and offered rich insights that are normally beyond the reach of most Canadians. His articles were particularly rewarding in giving the reader a glimpse into the lives of some of Newfoundland and Labrador's most influential, colourful and endearing individuals of the last 200 years. 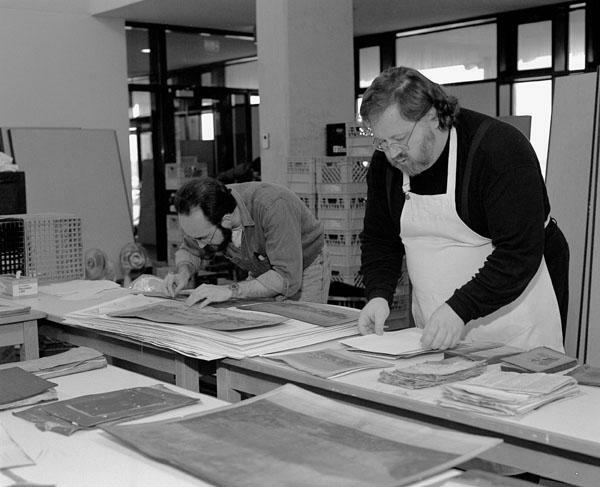 Bert Riggs (R) and associate, Bryan Russell, prepare damaged 18th and 19th century prints for drying. The Newfoundland and Labrador Heritage Web Site has digitized all 61 articles that appeared in the Gazette between November 1993 and December 1999. The Table of Contents provides a complete listing. Bert Riggs was chief archivist for Archives and Special Collections from 1989 until his retirement in 2015. From 1980 to 1983 he was a researcher/writer with the Encyclopedia of Newfoundland and Labrador and the managing editor of its second volume. Actively involved in the archival community, he was president of the Association of Newfoundland and Labrador Archivists, and the Newfoundland and Labrador Council of Archives. A past member of the Association of Canadian Archivists, he continues to serve on the National Archival Appraisal Board of Canada.